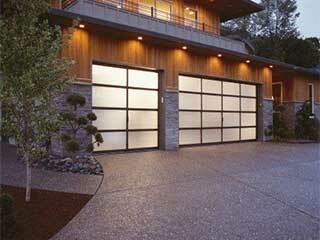 Getting tired of your old, worn garage door? Looking for ideas and a simple way to uplift the overall look of your property? We think fixing frosted glass panels to your door is a fantastic, low cost way to revamp the look of a door that could do with a facelift. Read on to find out more about the benefits of these panels. You may be surprised to hear that replacing existing panels with frosted glass replacements can dramatically increase the market value of your home. It's surprising how much of an impact this simple change can have – they'll look great during the day and brighten up the space inside your garage, creating a pleasant ambience at night when the lights are on. Even though the panels are made of glass, they are extremely durable and do not break easily meaning you'll be protected from theft and burglary in the same way as with other materials. You'll experience the benefits of a more attractive door and increased curb appeal without comprising on security. Frosted panels also provide you with the ability to maintain privacy – though you're using glass, no one will be able to see the contents of your garage. Glass panels are one of the easiest materials to maintain over time as they don't rust, are sturdy, and can be cleaned easily. Unlike wood, there is no risk of rot or deterioration over time, meaning glass represents a highly cost-effective option in the long run. Frosted glass panels are a great option to consider if customization is something you value. These panels come in all kinds of styles and sizes meaning you've got all kind of choices available to you when it comes to making your door unique. For example, glass panels come in a range of colors – opt for dark and rustic with grays and blacks or a more creative and unique appearance. It's entirely up to you! Interested in exploring the idea of frosted glass panels further? Just get in touch with us to discuss the options available to you!